The Valor DV-170 multimedia player gives you plenty of options for entertainment in your vehicle. This DIN-size DVD player fits in a number of today's dashboards to expand your factory stereo, or you can stow it away in the glove compartment or other accessible location. It'll play your favorite NTSC or PAL DVDs, music CDs, and burned CD-Rs or CD-RWs, including MP3 discs with digital music tracks. The versatile DV-170 also features a SecureDigital™(SD) memory card slot on its front. Use it to play your favorite music files or display digital photo images on your monitor. Got a USB device with digital media on it? Use the USB port on the player's face for quick access to music and movies. 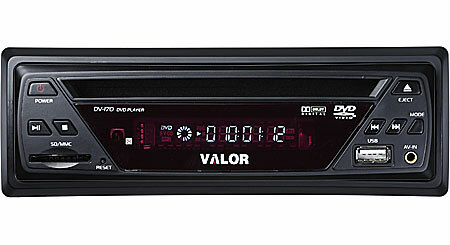 The DV-170 offers a front auxiliary input for adding audio and video from an MP3 player, game console, or other source. The included wireless control lets you access functions from anywhere in the vehicle.